Patek Philippe watches are not just for keeping time, they are possessions for any collector the world over. Owning a Patek Philippe is an item to pass from generation to generation. Count Antoine Norbert de Patek, an exiled Polish Nobleman, and his compatriot Francois Czapek founded Patek Philippe in Geneva in 1839. French watchmaker, Jean Adrien Philippe, joined the firm and later became the inventor of their famous stem-winding and hand setting mechanism. During the mid 19th century, Patek Philippe was a leading maker in the Swiss watch making industry. They built the standards of workmanship and pioneered functions that became the standard for upcoming watches in the early 20th century. Functions such as a perpetual calendars, a minute repeater and chronographs with split seconds were first seen on a Patek Philippe watch. 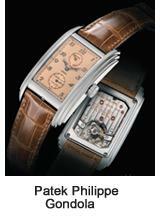 Not surprising, Patek Philippe made the two most complicated watches of all time. The first one was made for Henry Graves Jr. New York, and was completed at the beginning of the century. The second, the Caliber 89, the world's most complicated watch, completed in 1989 (hence the name) to mark the firm's 150th anniversary. Other than employing master watchmakers, goldsmiths, chain smiths, enamellers, jewelers and engravers were a part of the Patek Philippe design workforce making it a complete vertical operation. Patek Philippe watches are known for their highly complicated movements and decorated watches with enameled dials. The company continues to patent new inventions and improvements in horology and makes all the effort in maintaining the quality, prestige, and reputation of Swiss watch making. Their collection is classified as jeweled watches, casually elegant watches, classic watches, and complicated watches. Classic watches include the Calatrava collection which are named after the ornate cross — which is the company's symbol. Calatrava is considered as Patek Philippe's signature model. Its round dials mark the impeccable elegance of these watches. There are nearly 30 models in this collection and they boast of individual characteristics by distinct dial markings, hands and numerals. The Gondolo classic watch collection echo the spirit of the Art Deco period in history. They highlight the influential era, with their rectangular cases, and aesthetic charm. The Golden Eclipse is a world-class classic collection, which blends modern techniques with traditional principles. The design of this collection is inspired from a 2000-year-old mathematical principle- the Golden Section. The theory goes like this: the Golden Section exists when a rectangle is divided into two unequal parts and where the size ratio of the small section to the large section equals that of the large section to the whole. This very theory has influenced the artistic sense of these watches, for years now. The casually elegant collections include the Aquanaut and the Nautilus. Modern materials and styling blended with traditional craftsmanship, the Aquanaut comes in three robust sizes, either in gold or steel finish. While, the Nautilus sport the sporty look, mingled with the Patek Philippe finish. They are rugged in nature, but still maintain the style and design of a Patek Philippe watch. Jeweled watches sparkle with jewels and lustrous gems and are designed to be a perfect dress watch. The Twenty-4 is the modern version of the Gondolo. It was created for the modern, and independent woman, always on the move. They are studded with gold and precious jewelry. The 24-carat gold rings and earrings just make these watches exquisite treasures for the women folk. The complicated watches are segmented into grand complicated watches (which have a number of models), the Men's complicated watches, and the women's complicated watches. All of these watches are the finest mechanical timepieces. Repeaters from the previous century, to the time zone and moon phase watches of the present, these watches are complicated accomplishments of Patek Philippe. The Patek 3974 is an extremely rare, minute repeating astronomic, self-winding watch, with a perpetual calendar and moon phase. Likewise, the Patek 5004 is an astronomic, split seconds, and platinum gentleman's wristwatch with coaxial round button split-seconds chronograph, registers, perpetual calendar, moon phases and 60-hour autonomy from the late 1990’s. Other reference numbers include the 3970 and the 5059. Whatever the era, and whatever is the style of the time, Patek Philippe watches are particularly precious and priceless.